Spring is REALLY here in Indiana!! The weather has been gorgeous and we have been spending a lot of time outside doing fun activities (like teaching my 5 year old how to ride a bike…OK maybe it’s not all fun! 😉 ). I have slowly been freshening up my interior. 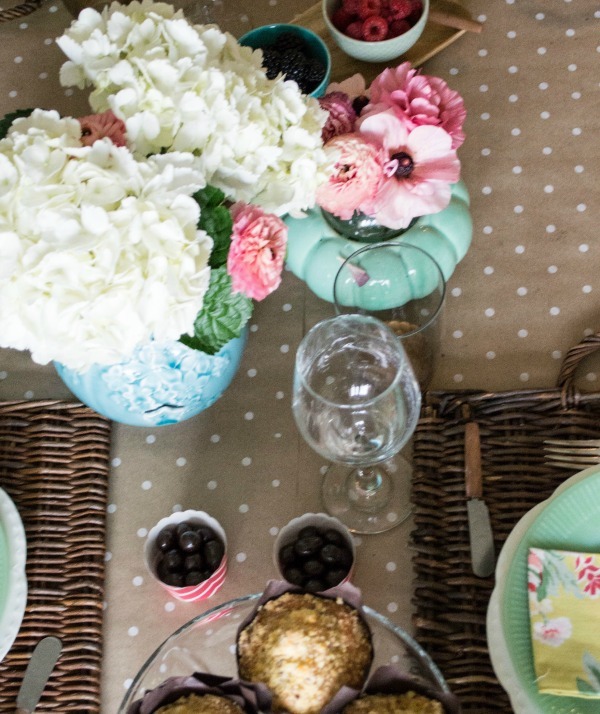 I’ve been bringing in seasonal colors and today I’m joining 14 other bloggers to share our Spring tablescapes. This time of year is my favorite color pallet because just about anything goes! Nature is full of a vast array of colors and it’s easy to mix and match them in your home. Here’s how I start with just about all my tablescapes. I pick a general color scheme and then gather things from around my house. In this case I decided to use my floral napkins as a starting point. One of the best suggestions I could ever give you when setting a table is to think outside the box…and use a paper table runner! I use craft paper most of the time, but I also love to use wrapping paper. I got this polka dot paper for only $.50! Wrapping paper is cheap, comes in just about any pattern you can imagine and you don’t have to worry about spills… because you can just throw it away after your meal. 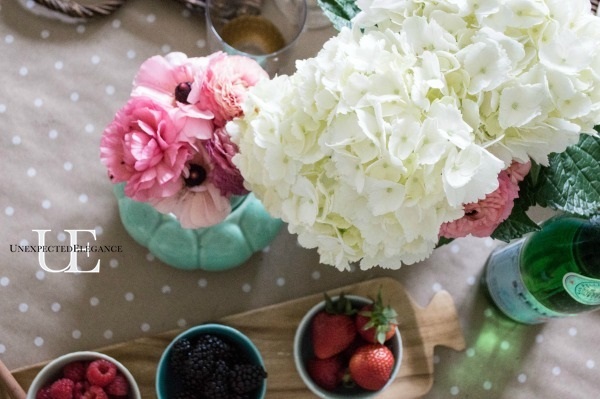 For any table, the best accessory is fresh flowers and colorful food. I always get my flowers from either my yard or the grocery store because they are fairly inexpensive. 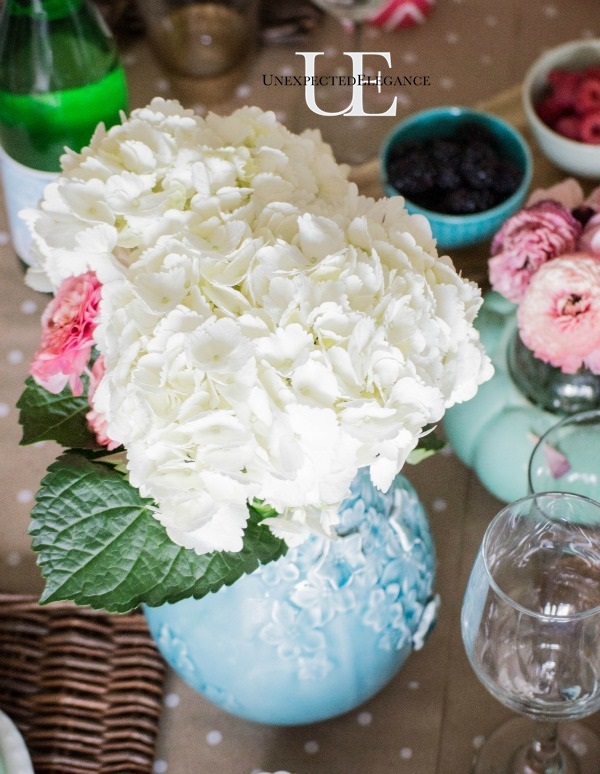 Larger flowers, like hydrangeas, are the best bang for your buck. There are only two flowers in my vase and it fills it out really well. Also, don’t be afraid to cut the stems short. I think flower arrangements look best when the flowers are just slightly taller than the vase. Sorry, I got a little carried away taking pictures! 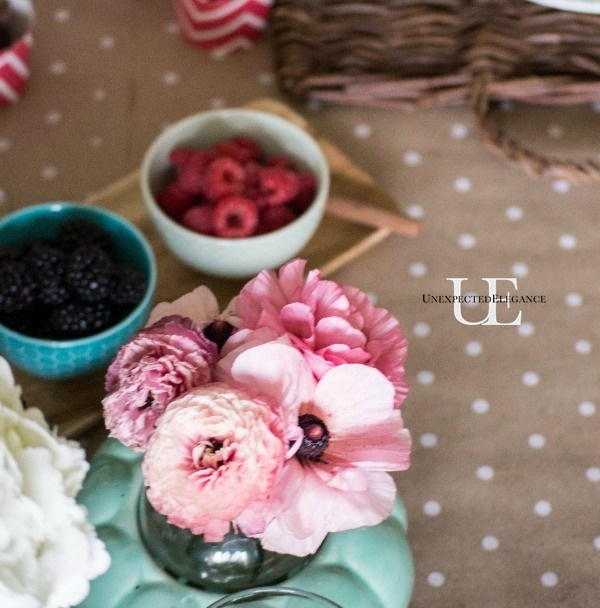 Your springy floral napkins are perfect to pull all the colors together on your spring table. I agree with you that using paper gift wrap is a great way to create a special runner without breaking the bank. Not only do you not have to worry about spills, you don’t have to store it! 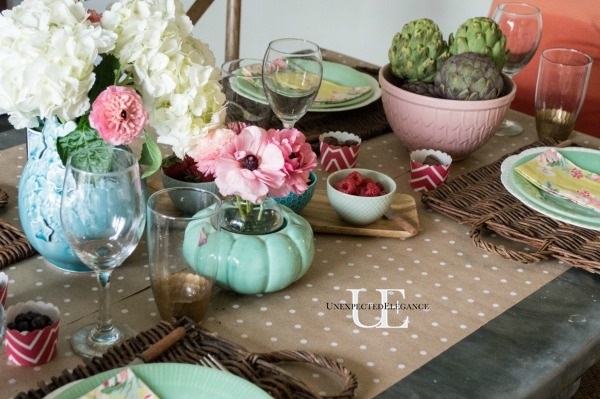 Great tablescape with equally great tips…. First of all, I love your zinc top table. It’s fabulous!! 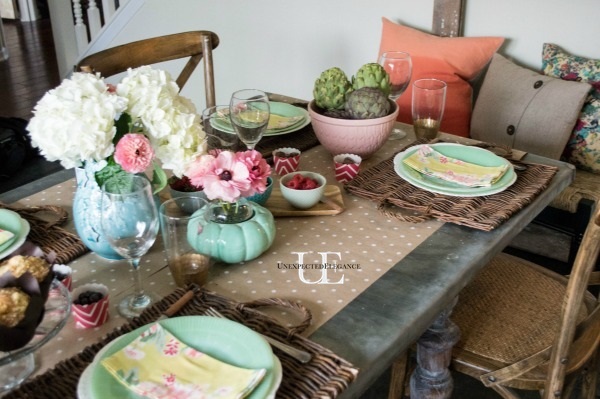 And the colors you incorporated into your spring tablescape are so yummy!! Spring is a great time to bring out all the pretty pastels. 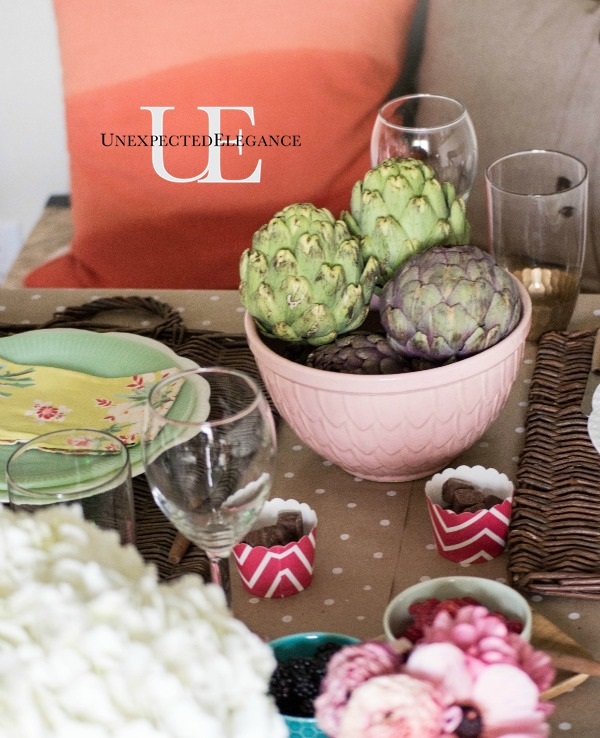 Everything is so lovely on your table. Would love to pull up a chair! Gorgeous! 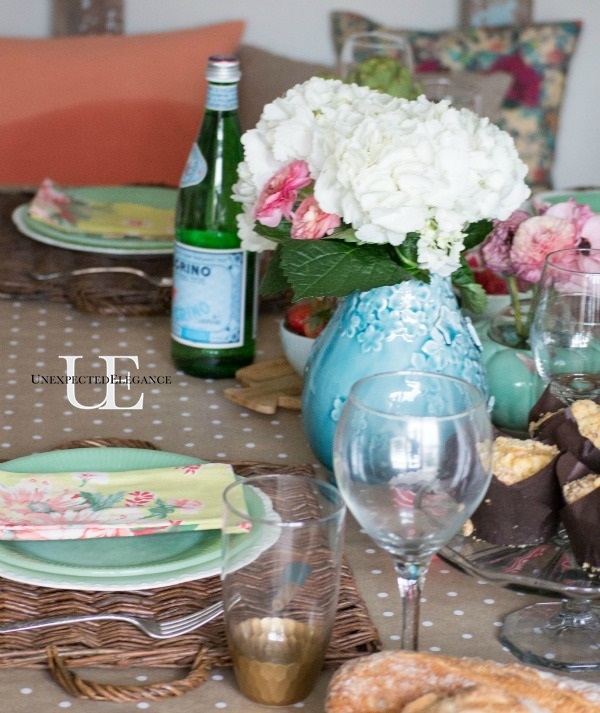 I love all of the spring colored dishware, flowers and polka dot runner! 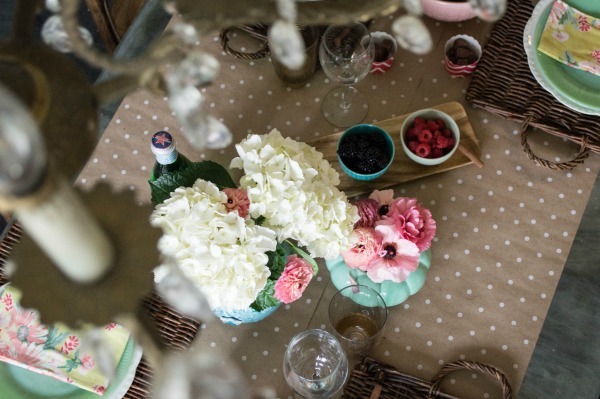 Great tablescape idea! Your table is a real beauty!!! 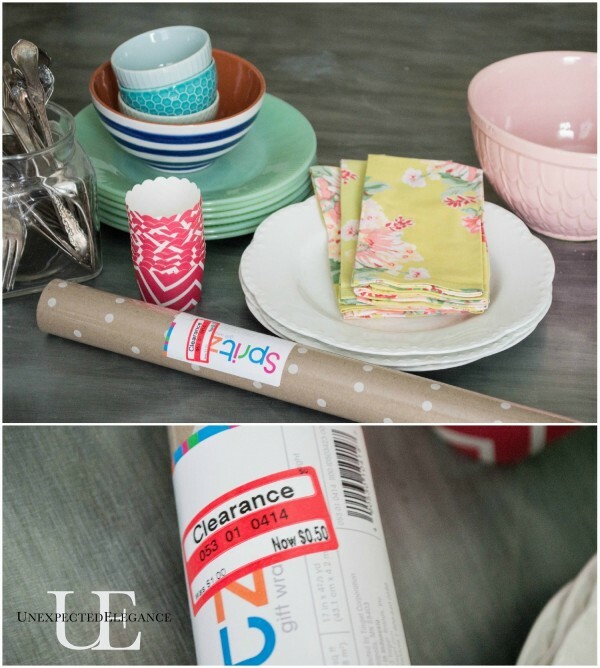 LOVE the idea of using a roll of wrapping paper as a table runner. Such a brilliant idea. This is a table I could sit at all evening! Relaxed, chic and very European. Thanks for all the inspiration!!! 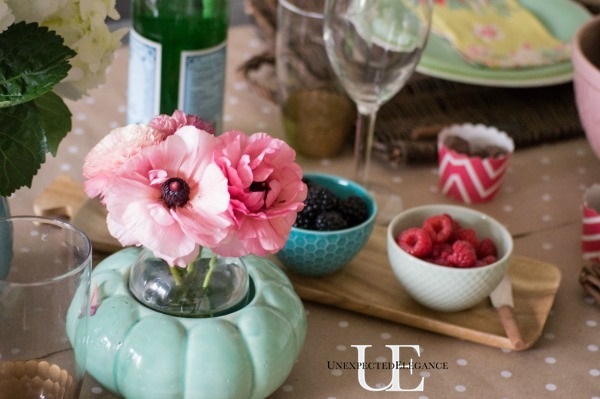 Beautiful tablescape for spring! Love all the soft colors and the wrapping paper runner is such a great idea! Your setting is just fab! 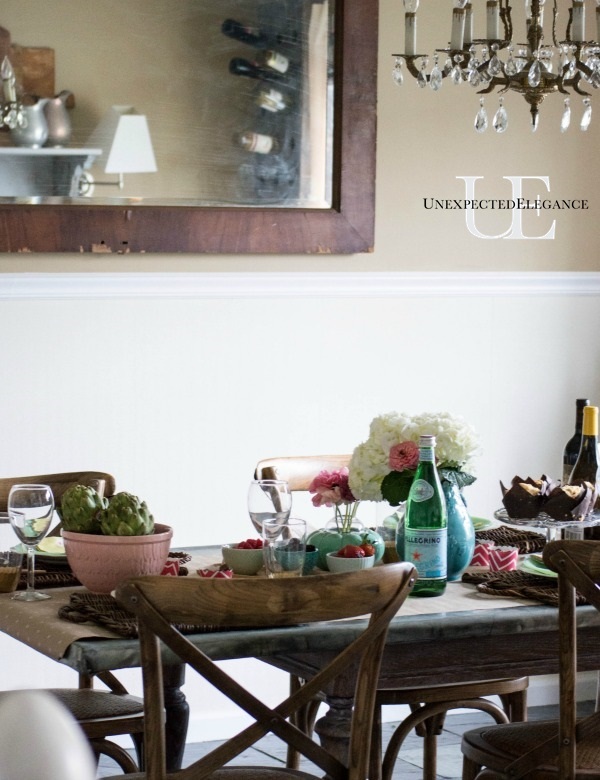 I love the Europe-meets-Bohemian vibe of this setting, it reminds me of something right out of Anthropologie! The paper as a runner is brilliant. Thank you for sharing. Visiting you from The Scoop. Lovely table! I can’t wait for the hydrangeas here to bloom, it will provide centerpieces for weeks. I visited all the tables listed for today. 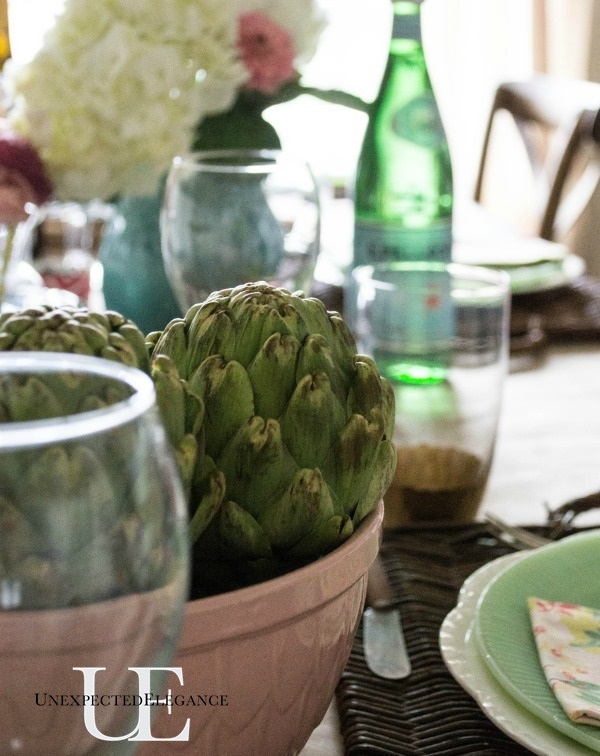 Such refreshing hues within your tablescape and your food choices, dear one!!! 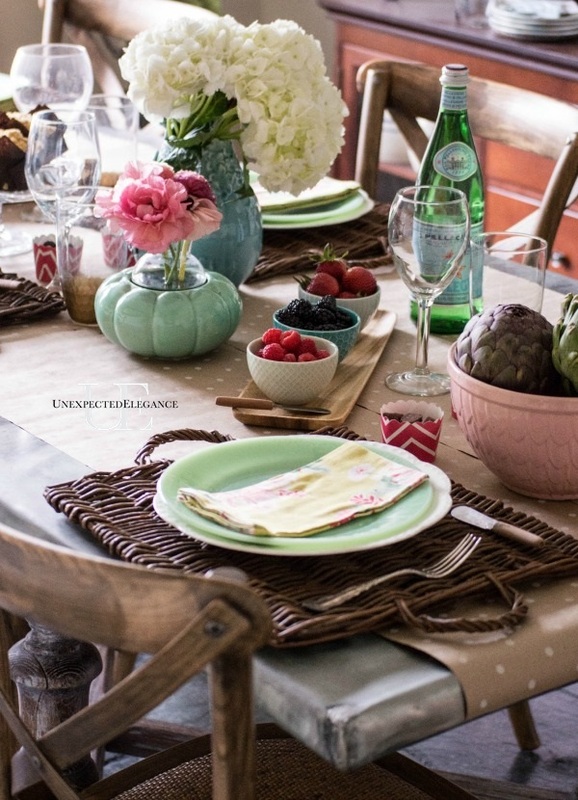 I love your cloth napkins and the vintage jadeite dinner plates!!! Clever idea for a table runner!!! I had purchased aqua and cream print gift wrap for my vendor booth. . .
then forgot to put it down until I noticed I hadn’t used it in my photos! I’ve used this wrapping paper in a similar fashion in my creative space!!! Enjoy those days out~of~doors with your children. . .time passes far too quickly! 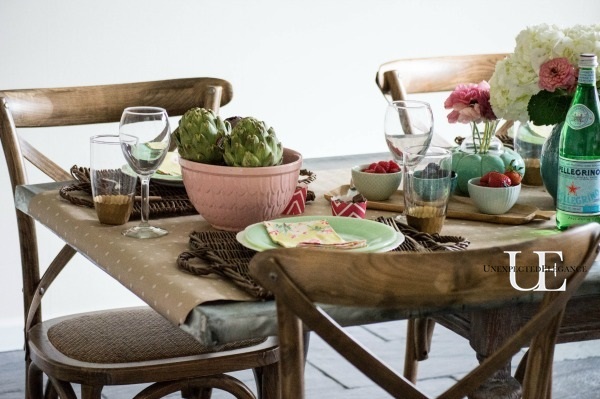 Love the color combo and your dining chairs are really cute! 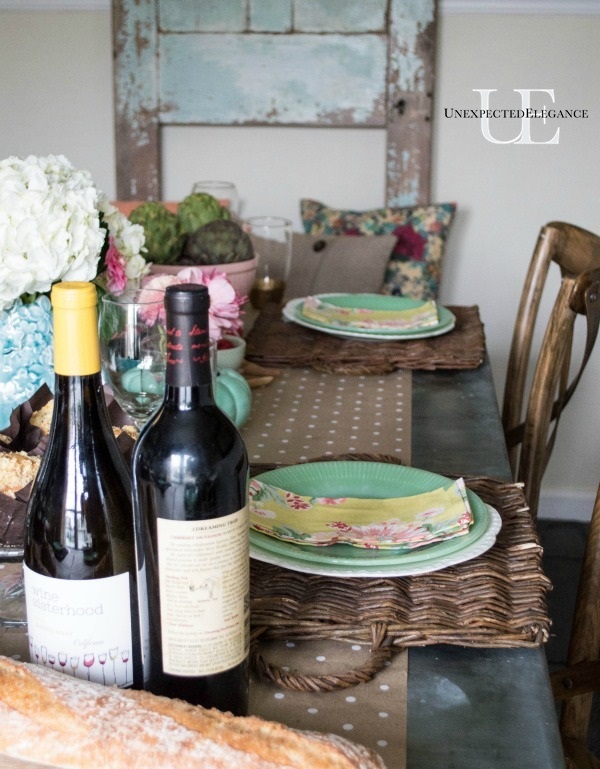 your spring table is perfect. I have never used wrapping paper as a runner but what a brillant idea. enjoy! It looks gorgeous Angela! I love the idea to use wrapping paper as a runner! Where did you find wrapping paper so cheap?